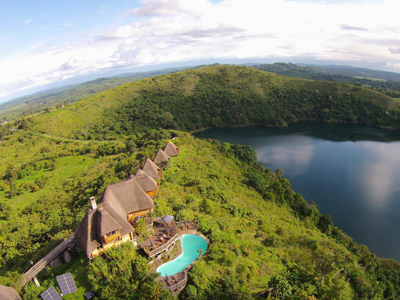 This is the ultimate Uganda adventure. 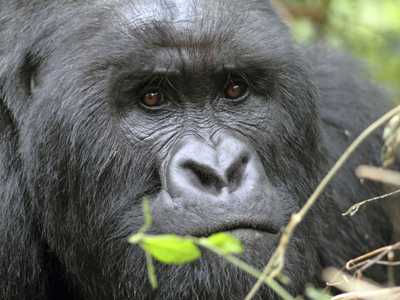 From your arrival in Kampala to Kibale Forest and its species of apes, Queen Elizabeth National Park and its varied species of game, Bwindi Impenetrable Forest and its up close and personal gorillas, Lake Mburo National Park and its one of a kind activities all the way back to Kampala, this trip is truly a whirlwind experience. In the morning after breakfast our safari guide will pick you from your place of stay, to begin your journey west to Kibale Forest Natonal Park (transfer duration: approximately 5 hrs). Drive through the green tea plantations and the evergreen Kibale forest, arriving Fort-portal in time for Lunch. You'll then proceed to the lodge, arriving in the afternoon. Relax after you long drive and enjoy the remainder of the day at your leisure. After breakfast, we shall drive to Kanyanchu Park Headquarters in time for a briefing before heading out to the forest, for an early morning Chimpanzee Tracking experience. Your guide will help you search for chimpanzees and other primates within the park, as it is host to 13 species of primates. The guide will provide detailed explanations on not only primates, but also on all the forest's fauna and flora, ensuring that your walk is both informative and enjoyable. This walk is excellent for viewing bird life and primates in close quarters. A visit to Bigodi swamp eco-tourism site is amazing, as you encounter rare and beautiful flora and fauna. 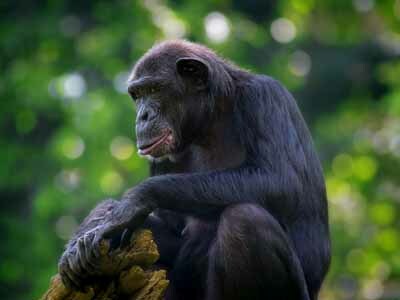 Please Note: Chimpanzee Tracking takes approximately 3 to 4 hours. After breakfast, proceed to Queen Elizabeth National Park, following the mystical Rwenzori Mountain Range most of the journey (transfer duration: approx. 3 hrs). Explore the Katwe crater area en route and later proceed to the Lodge for lunch. After lunch, enjoy a game drive where you may be rewarded with game including the waterbucks, Elephants, Leopards, Buffaloes, Hyenas and a variety of Antelope species. This evening enjoy a sundowner in the savannah and return to the Lodge for dinner with an option to go for a night game drive. After an early morning rise, and a cup of your favorite beverage , embark on a morning game drive along Kasenyi track and Queens mile in the park and keep a watch out for Lion, Elephant, Cape Buffalo, Warthogs, Leopard, Hyena, Mongoose, Waterbuck, Ugandan Kob, and lots of the many small animals and birds. 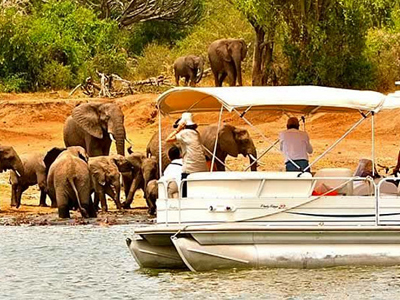 After lunch, enjoy a unique boat cruise on the Kazinga Channel and into Lake Edward. This trip passes through high concentrations of Hippos and a wide variety of animals may be seen drinking at the water's edge. This river cruise offers an excellent platform for photography, bird watching and game viewing. The prolific bird life is colorful and stupendous with well over 600 recorded species having been spotted. After an early morning breakfast, proceed to Bwindi via the Ishasha sector of the Queen Elizabeth National Park (transfer duration: approximately 4 hrs). As you drive along the road via Ishasha sector, famous for it's tree climbing lions you should see a multitude of animals. Arrive at the lodge in the afternoon, relax around the camp or take a village walk around the Buhoma. 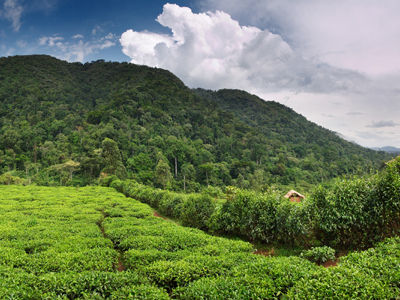 The walk takes about two hours and begins with a stroll through a small tea farming project. Here you can stop to meet the tea pickers and perhaps even learn how to pluck tea leaves along the way. Then visit a local beer brewery and see how they mash bananas to make a fermented brew which is mixed and distilled to make banana beer - a popular local drink in the area. From here walk a short distance to the local hospital which Sanctuary Gorilla Forest Camp supports through various projects. Learn about how it started and the work they do for the community. Continue your walk to a nearby village and visit a traditional medicine man. The knowledge of using herbs for healing has been passed on from generation to generation and he will show you some of the herbs that grow in the forest and talk about how they are used. Later, relax and enjoy a performance by the Batwa community before returning to the camp. There is an early morning entry into a gorilla sanctuary. The rainforest is spectacular, heavily vegetated and dense landscape crisscrossed by numerous animal trails, allowing access for trekkers. This park is best known for the fascinating gorillas, where the time taken and terrain varies according to the movements of these fantastic apes. 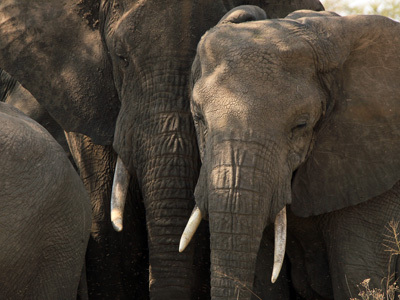 The thrill of spending time with and observing these gentle giants is a rare and moving adventure that will leave you with long lasting memories of a truly unique experience. The gorillas are shy and peaceful animals and it is an unforgettable experience to watch and photograph them as they interact with each other, return to the lodge in the afternoon. Please Note: Gorilla Tracking takes approximately 3 to 10 hrs. After breakfast, start for Kihihi airstrip in time for your 9:45 AM flight arriving Entebbe Airport at 11:25 AM. 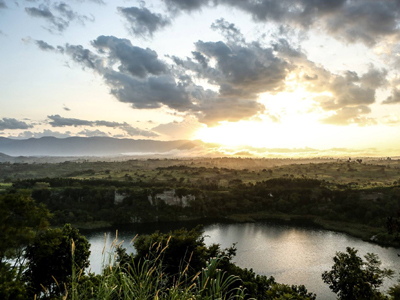 Depending on the weather, you may have the best views of the Volcanoes, villages and Lakes as you take off, proceed to the airport and connect to your onward international flight. *Please book return flights departing Entebbe after 1pm. **Note that flight schedules are subject to change. Set against a stunning backdrop of Lake Kyaninga and the legendary Mountains of the Moon beyond, Kyaninga Lodge is the spectacular result of one man’s vision and six years of unwavering commitment to creating an experience of Africa’s beauty unlike anything else. Kyaninga Lodge’s eight cottages are built on platforms and set apart to offer privacy and tranquility. Access to the cottages from the main lodge is via a raised wooden walkway. Each spacious cottage is beautifully appointed with a a choice of twin or double beds made up with the softest bedlinens and feather pillows. An indoor sitting area leads out to a private deck where one can enjoy morning tea or coffee and views over the lake and the Mountains of the Moon beyond. The en suite bathrooms boast marble countertop basins set atop beautifully crafted Elgon Olive pedestals, claw footed freestanding baths, glass walled showers and plenty of hot water from solar water heaters. Lighting in the cottages is also solar powered, and each cottage features an electrical socket for the charging of laptops and other appliances, providing the comforts of home in an extraordinary setting. Bwindi Impenetrable Forest impresses with a truly theatrical landscape - this is a region of volcanoes, jagged valleys, waterfalls, lakes and dramatic mountain ranges. 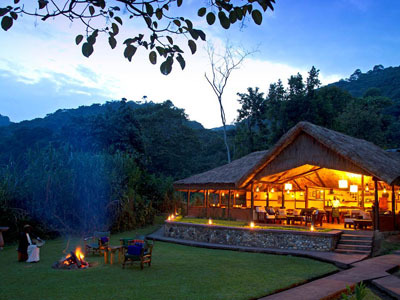 And it is here, on a flat ridge high in the forest, that Sanctuary's Gorilla Forest Camp is tucked away. It's hard to fathom that such luxury and sophistication could be available in an area as remote as this. 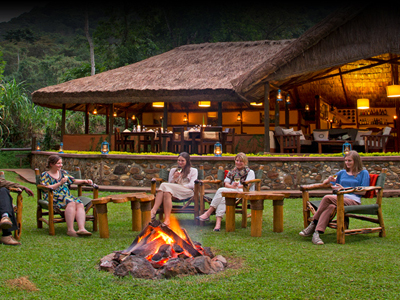 Sanctuary Gorilla Forest Camp is the ideal base for a gorilla tracking adventure in Bwindi. Guests can dine under the stars and relax by the roaring campfire. On cooler evenings, the central cottage provides a warm shelter. Located within the National Park, Sanctuary Gorilla Forest Camp offers guests an unrivalled location, including the best bird and wildlife viewing in the Bwindi area. In fact Sanctuary Gorilla Forest Camp often receives regular visits from the gorillas themselves, up to 4-6 visits per month. For the lucky guests in camp at those times, they may have the chance for a gorilla encounter without even leaving Sanctuary Gorilla Forest Camp!